This is a Peggy 2le Kit that I assembled from www.evilmadscience.com/. 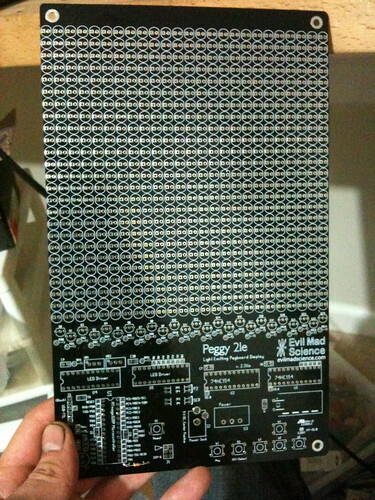 It is a 25×25 LED matrix that is based around an Atmel ATMEGA328 and programable through the arduino environment. I have written some software for it as an exercise to get back into programing. Check out the videos of the Peggy lighting up its 625 LEDs! Actually it has been a really long time since I posted last. Expect to see a bunch of updates and some post format changes soon! I have some exciting projects, some pictures of nice cars I have gotten to work on, and some pictures of the house I am living in.